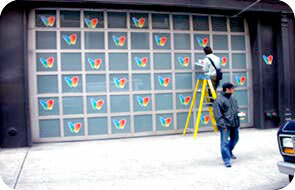 "Microsoft unleashed a swarm of large adhesive butterflies in Manhattan. They settled yesterday morning on sidewalks and doorways; traffic signals, stop signs and planters. They alighted on the bluestone paving around Grand Army Plaza and the granite corners around Grand Central Terminal. Their blue, green, orange and yellow wings had spans of 12 to 20 inches, the larger ones accompanied by a caption –– 'It's better with the Butterfly' –– advertising Microsoft's new MSN 8 Internet service. A single summons was issued, with a [US] $50 penalty, though each butterfly could have been subject to a $50 fine, said Tom Cocola, the assistant commissioner for public affairs at the transportation agency. He said the city's chief goal was seeing to it that the decals [slickers] are removed. 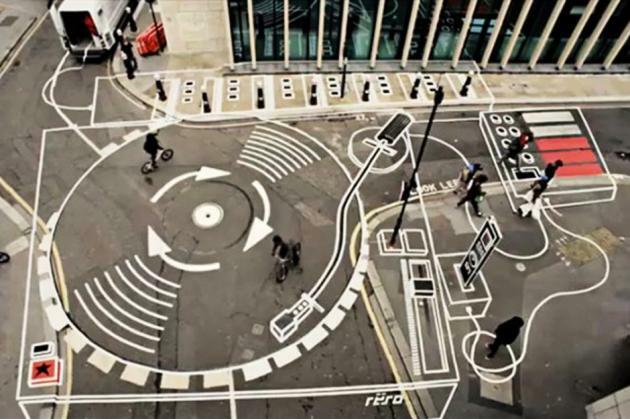 Microsoft, for its part, insisted that it was authorised to place the decals."